I asked the new dynamic duo of Caroline and Monica to provide a little background about themselves. They are taking on the role of Curriculum Co-chairs for 2016. Here are their stories in all their unvarnished glory. 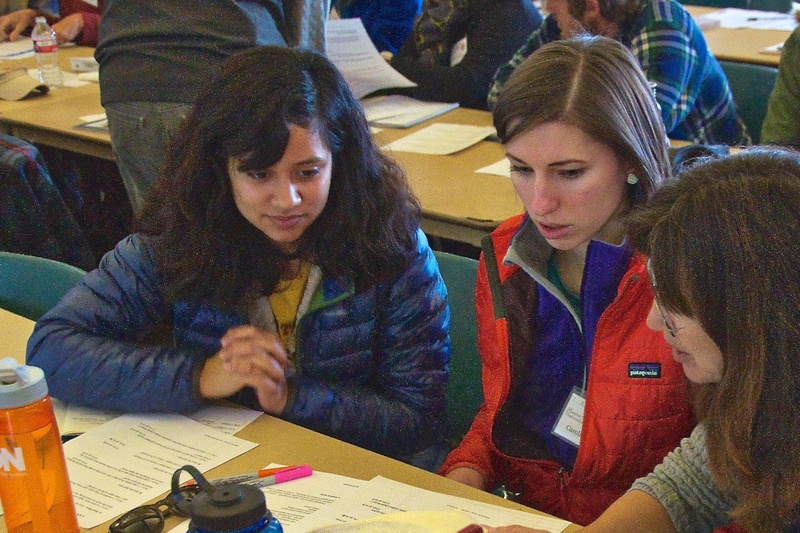 Monica (left) and Caroline (center) participating in mammalogy class exercises. Caroline has a passion for nature, and a talent for sharing it. She first discovered the naturalist community while studying land management issues abroad in Costa Rica during college. After graduating, she began pursuing her passion as a summer camp counselor at the Austin Nature and Science Center. There for two years, she facilitated school programs, designed after-school programs, and led summer camp sessions on a wide variety of natural sciences. Near the end of her first summer at ANSC, after wrangling 12-year-olds all over the Hill Country for three months, her gaggle of pre-teens visited Westcave Preserve. That day, she fell in love with the famous Westcave Grotto, the so-called “hidden gem of the Hill Country.” She has been avidly volunteering and/or on staff ever since. Caroline received her bachelors degree in Psychology and her minor in Biology from the University of Texas in 2012; at her day job, she is currently infusing her enthusiasm and training skills into the Software Development community at UT. She is pleased as plum to have joined the ranks of Capital Area Master Naturalists, and is excited to become an active member of the community. I was immeasurably inspired during a study abroad trip to Costa Rica by the incredible diversity of life that can abound in the small square footage of a cloud rain forest. This is where Caroline and I met many years ago and connected admiring the intrinsic beauty of a place teeming with life. I studied biology at UT with a concentration in ecology, evolution and behavior. While there, I worked in a lab that studied basic evolutionary theory with wimpy viruses in the Freshman Research Initiative as a mentor and later became involved in a microbial ecology lab studying endophytic fungi for a short-term research project. I’ve been working for the TCEQ for a couple years now since leaving school working with air quality regulation rules and upholding air pollution reporting standards. Through this experience, I’ve developed an interest in conservation policy and am interested in pursuing a masters degree once I get a better idea of where I want to take things. Outside of work though, I’ve greatly enjoyed learning about bird and plant identification! I’ve been assisting Angela England the past few months with an invasive species removal study, monitoring girdled ligustrum trees/shrubs/demons in the East Boggy Creek greenbelt trail which gets extra boggy in the summer.